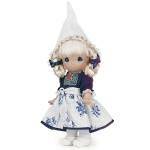 Precious Moments Company 2009 All Vinyl 9 inch Jack of England doll, No. 3432, is from the Children of the World collection. He has long brown hair under his tall black palace guard hat with a gold tassel, brown teardrop-shaped eyes, and a smiling face. The rest of his uniform consists of a red coat with black and white ribbon trim, a gold buckle and gold buttons; black pants with red stripes, and black boots. New and mint with a gift box.